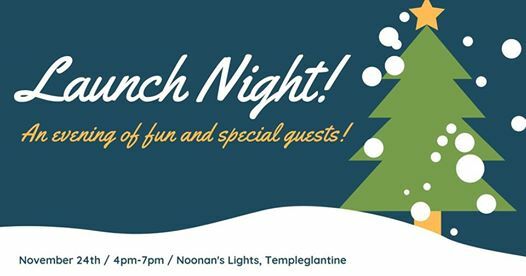 Tony Noonan’s Christmas Lights LAUNCH NIGHT is on November 24th 2018 (4-pm-7pm) in Templeglantine, Limerick – if you’re local – don’t miss this! We wish Tony the very best for the night – an evening of fun & special guests is promised and Tony won’t disappoint! Tony Noonan has dedicated the past number of years collecting funds for local charities during the Christmas period with his Christmas light’s display. Our 2017 collection brought in €19,626 for local charities that are deserving of the money. This has been donated to six wonderful and deserving charities – Brothers of Charity Newcastle West, Adare Alzheimer’s Branch, Milford Care Centre, C.R.Y. Monegea, Recovery Haven Tralee, and Brothers of Charity Foynes. 2016, saw a collection of €26,700, all going to local charities. During this year, he also won €4,000 from Energia after being awarded Energia’s “Most Christmassy Home 2016”! All of which was given to the charity.